Director Sankalp Reddy of Ghazi fame is as young as he is unassuming. His debut put him on the map as a unique filmmaker. Just two films in his career graph is comparable to a rollercoaster with him coming out on top! Ghazi was the first Indian film based on a submarine and now Anthariksham is the first serious Indian film to be set in space. Read ahead to find how many more firsts Sankalp has in store. Tell us about your life story. It’s actually very simple. I’ve got an engineering background. I did computer science from CVR college. After that I tried for the US visa somewhere between four to six times but got rejected. This was around 2008. In the process I wasted one year so everyone told me to do my MBA in Australia instead. I went there and once I started the course I realised that it was not for me. I immediately switched to a film making course in the same college. All the while my family thought I was doing my MBA. When I came back after 1.5 years I told them. My parents were shocked and they tried their best to make me change my mind about following a career in cinema. Finally they did support me and I started a CG studio because I had also learnt about that and figured it was a good in to the film world. Unfortunately that didn’t work out but then I started working on Ghazi right after it. I got married and my wife was carrying. At that point there was an event at her home town and she couldn’t travel so I decided to go instead of her. On the return train journey I went through Vizag. It was there on the beach road that I saw a submarine named INS Karusura. In that instant something clicked in me. After that I researched about Ghazi and worked on a script around it for about a year. A lot of research went into it. After that I once again took money from home to make the movie. I ended up making the set and started the CG work. Even before a single shot was taken the whole 25 lakhs was spent. Luckily I then met Niranjan, then PVP, then Rana Daggubati garu. After that the movie took off and we secured a great cast. Finally the film won a national award and got recognition. When you started working on Ghazi, content films were still not in vogue. What prompted you to take on such a huge risk? Yes, the transition to content based films was just at its beginning. After I started working on Ghazi, Kshanam and Pellichoopulu released. Ghazi is not only anti-commercial but it is also based on the India-Pakistan issue which is more of a threat in the North. What worked for it though is that it’s a local story of our heroes from Vizag. Also luckily our producers backed the project; otherwise I might still be struggling. Did your education affect your style of filmmaking? During my filmmaking course I learnt about script writing techniques and CG techniques which really helped in my career. I also watched a lot of films in school and through them the idea of how to convey a story got etched in my mind. My style is evidently different from most Telugu films. And now you have moved on to space. For the first month after Ghazi I received no calls but post that I was getting a lot of calls. At about the third month mark I was asked for stories. I had some ideas but none that were really inspired. Then I came across news article which gave me the idea for Anthariksham. Tell us about the casting. Casting Varun was instinct. Rajiv Reddy and Varun were friends so when they teamed up this project worked out. How difficult was it to shoot Anthariksham? It was very taxing for the actors because it was physically extensive. The DI, look, music, everything to do with the film was very thought out. I had a reference point for all the elements before we started. I work with a story board so I make sure it’s done and that everyone involved is happy with it before we go on set. During the shoot it is clear because the templates of everything including the shots and angles are mapped out on the story board. How satisfied are you with Anthariksham compared to Ghazi? Ghazi for me is synonymous with a lot of struggle and pain which really connected me to it. It was also my first film and done a couple of years prior so a lot has changed in that time including my sensibilities. While watching Anthariksham, the audience won't know if they are watching a Tollywood film or a Hollywood one. We maintained the standards and did not compromise on a single shot in the seven months. I am 100% satisfied. Also the audience will not expect the twists. They will not see the turns in the plot coming and won't expect that the movie could turn out in that way. Since this movie is set in space, everyone moves slower but this is a thriller. Usually thrillers are supposed to be fast paced but in this film you will feel the tension entirely differently because of the intercutting, music and drama. We also followed logic as much as possible. I’ve got two kids and I don’t want their friends making fun of the film later on so I made sure that it is sound in its reasoning. I hope that it will be timeless and a classic. Ghazi was released and marketed nationwide. Why not Anthariksham? Ghazi was backed by Dharma productions and with Rana’s close ties to the production house it was possible to go national. Antariksham was always meant to be a straight Telugu film. We didn’t want to dub it even in Tamil. We thought that giving remake rights would be the better way to go. What can we expect from Anthariksham? It is a human drama; a very emotional thriller. It is not inspired from interstellar, Martian or any other Hollywood film. The storyline is connected to an ISRO incident but fictional. 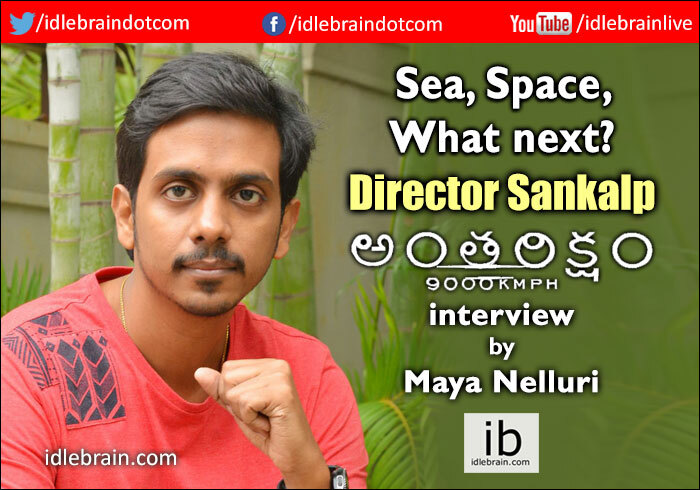 You’ve made movies about sea, space; What’s next? I think more people are worried about my third film than the second. *Laughs* There's a lot of interesting stories but nothing is set in stone. What is your advice to aspiring filmmakers? Never do a regular story; be unique. People will always appreciate a good film.